In the team’s 22-14 loss to Florida on Saturday afternoon, sophomore goalkeeper Anna Tesoriero allowed 22 goals, the most by any Seawolves netminder in Joe Spallina’s coaching tenure. The trip to the Sunshine State was clouded with rain; it was a game to forget. If Monday night’s performance against Jacksonville is any indication, it has already been forgotten. Tesoriero stopped 16 shots, the most in her collegiate career, as the Stony Brook women’s lacrosse team defeated Jacksonville 13-5 on the road Monday night. Ten of the sophomore’s saves came in the second half, as the Dolphins looked to mount a comeback. Tesoriero backed a defense that returned to its usual form. On offense, Kylie and Taryn Ohlmiller led the way again. The junior and freshman attackers scored six and five points respectively. Kylie now ranks third in program history with 227 career points, still with nearly two full seasons of play left in her career. 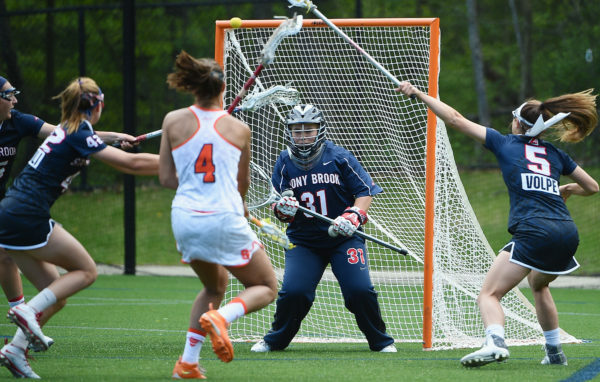 Stony Brook controlled 15 of 20 draw controls, which provided valuable extra possessions to catalyze its victory. The Seawolves are now 4-0 all-time against the Dolphins. Senior midfielder Dorrien Van Dyke had three goals in the game. She is tied with Demmianne Cook, a 2013 Stony Brook graduate, for second in program history with 158 goals, trailing only senior attacker Courtney Murphy, who missed her third consecutive game. The game was played under heavy rainy conditions, but the No. 8 Stony Brook was able to better handle the inclement weather to improve its overall record to 6-1 this season. The Seawolves have a long layoff until their next game, scheduled for Mar. 24 at home against the University of Southern California Trojans. USC is ranked No. 5 in the latest iteration of the Inside Lacrosse national poll.